Suggested Use: Take one to three caplets daily as a dietary supplement. Take thirty (30) minutes before breakfast or lunch. The Peruvians may have been the first to realize the beauty of Maca, but they thankfully did not keep it a secret from other cultures. The Spanish soon found the miracles of Maca after their conquest of the area. They were having trouble breeding their livestock until a native disclosed the secrets of the mysterious plant. Soon Maca became more valuable than gold. Along with being a great source of nourishment, Maca is also used for treating ailments, reducing stress, and contributing to successful weight loss. One of the first ways natives used Maca for medicinal purposes was to enhance fertility in humans and animals. Maca is a hardy perennial plant cultivated in the Andean Mountains. It was domesticated about 2000 years ago by the Inca Indians, and primitive cultivars of Maca have been found in archaeological sites dating as far back as 1600 B.C. Native Peruvians have traditionally utilized Maca since before the time of the Incas for both nutritional and medicinal purposes. Maca has always been an important staple in the food crop grown there. It is rich in sugars, protein, starches, and essential minerals, especially iodine and iron. In Peruvian herbal medicine, Maca is used as an immunostimulant for anemia, tuberculosis, menstrual disorders, menopause symptoms, stomach cancer, sterility and other reproductive and sexual disorders as well as to enhance memory. This energizing plant is sometimes also referred to as Peruvian ginseng, although Maca is not in the same family as ginseng. Today, Maca is most commonly used to increase energy, stamina and endurance in athletes, promote mental clarity, treat male impotence, and help to correct female hormonal imbalances including menopause and chronic fatigue syndrome. European doctors have prescribed Maca for a variety of health-related illnesses and weight management for more than a decade and have found it more helpful than synthetic western medicines. Maca is growing in world popularity due to its energizing effects, fertility enhancement and aphrodisiac qualities. Maca is a nutritional powerhouse especially rich in iodine. It is a reliable protein source containing significant amounts of amino acids. The protein and calories in Maca are stable even after years of storage. It is also rich in complex carbohydrates and essential minerals such as calcium, magnesium, phosphorus, zinc, and iron. It contains vitamins B-1, B-2, B-12, C, and E and is a source of glycoside steroids. Maca is an "adaptogen", meaning it helps to restore balance or homeostasis to the body. Rather than addressing a specific symptom, adaptogens are used to improve the overall adaptability of the whole system. Maca has been used traditionally to increase energy and to promote improvement in both stamina and endurance in athletes. Unlike caffeine, Maca is a healthy choice for increasing energy because it is not a stimulant. The steady enhancement of both physical and mental energy makes Maca an ideal supplement for students, professionals, writers, athletes, and anybody else who needs a lift. The fact that Maca contains no stimulants, but obtains its benefits from vitamins and minerals, makes it especially beneficial for individuals who suffer from chronic fatigue syndrome. Many people who use Maca also report increased mental clarity. The Indians who first used Maca believed it to be a significant fertility aid for both animals and humans. This explains why Maca is often described as an aphrodisiac. Aphrodisiac or not, it may be used to address hormonal imbalances in women. Maca offers a natural solution to symptoms of both PMS and menopause. Calcium and magnesium are well known for their beneficial effects on the female endocrine system. Maca is a good source for both of these important minerals and is a very rich source of iodine, which is also important for the endocrine system due to its effect on the thyroid. 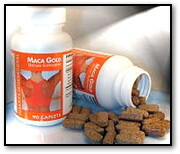 Further reports indicate that Maca may help treat male impotence. Choline Bitartrate - Protects against damage of cells by oxidation and against cardiovascular disease and memory loss. Lecithin - Lecithin is used by every living cell in the body. It can aid in the absorption of the fat-soluble vitamins A,D,E, and K. Lecithin contains the compound Choline which is turned into acetylcholine in the body. Acetylcholine transmits electrical impulses in the brain and supports a healthy nervous system. Choline helps prevent arterial congestion, helps distribute bodyweight, aids in cleansing the liver and purifying the kidneys. Lecithin is also required for proper fat and cholesterol metabolism. It acts as an emulsifier, causing large molecules of fat to break into small molecules which pass readily through arterial walls. Vanadyl Sulfate - Vanadyl Sulfate is derived from the mineral vanadium and has been popular in bodybuilding since the late 80’s. It is said by users that it enhances muscle fullness and gives them an "improved pump". It is believed that vanadyl sulfate can mimic the actions of insulin, thus increasing the amount of glucose and other nutrients into the cell. This may lead to increased cell volume and possibly to an increase in protein production. Guar Gum - Is a dietary fiber and stabilizer from the seed of the Guar plant. Psyllium - Psyllium is probably the single most effective dietary ingredient for lowering serum cholesterol. A dietary fiber, Psyllium is the husk of the seed from a shrub that grows in India and the Mediterranean. Calcium-Pyruvate - A discovery made at the University of Pittsburgh School of Medicine showed that a diet supplemented with pyruvate increased fat loss by up to 48% and minimized the associated loss of body protein. Normally, during a dietary restriction to promote fat loss, there’s always a corresponding loss of muscle; this study showed otherwise. Inositol - Inositol acts as a lipotropic agent in the body, helping to emulsify fats. It is especially important for the cells of bone marrow, eye tissue, and intestines. As a mild lipotropic agent, it is commonly used by overweight people to help with weight loss, and it may help in redistributing body fat. Inositol has also had some success therapeutically in improving the nerve function in diabetic patients with pain and numbness due to nerve degeneration. Generally, diabetic people should take extra inositol. People with multiple sclerosis may also receive some benefits, as there seems to be a higher percentage of inositol deficiency in nerve cell membranes in those patients. Chickweed - A soothing, cooling, slightly saline herb that relieves itching, promotes healing, and has alternative, antiheumatic effects. Internally for rheumatism. Ginger - A sweet, pungent aromatic, warming herb that is expectorant. It increases perspiration, improves digestion and liver functions, controls nausea, vomiting, and coughing, stimulates circulation, relaxes spasms, and relieves pain. Chromium Polynicotinate - Chromium Polynicotinate is safe and effective. It works by making your body’s insulin function correctly. Insulin builds muscles by stimulating amino acid uptake, while accelerating fat breakdown. This improves metabolism so that your body relies more on using stored fats. The results are more energy, and the reshaping of your body to a leaner, trimmer and firmer you. According to U.S.D.A. studies, 9 out of 10 Americans get less than 50 micrograms of Chromium daily as compared to the 50 to 200 micrograms recommended by the National Academy of Sciences. Methylsulfonylmethane (MSM) - MSM disinfects the blood, helps the body to resist bacteria, and protects against toxic substances. Because of its ability to protect against the harmful effects of radiation and pollution, MSM slows down the aging process and helps to improve the appearance of hair, skin, and nails. White Willow Bark - White Willow Bark helps relieve insomnia, helps to reduce pain, and is an anti-inflammatory. Guarana Seed Extract - Guarana Seed Extract is a high energy source. Green Tea Extract - Green Tea Extract is an antioxidant, detoxifier, and is beneficial to overall nutrition. Garcinia Cambogia Extract - This is an extract of a tropical Asian fruit, also known as Malabar tamarind, or Brindall berry. Garcinia Cambogia is rich in (-) hydroxy acid (HCA). Various studies have shown that hydroxy citric acid may help to prevent the liver from forming fats from dietary carbohydrates. HCA increases the production and storage of glycogen, while reducing both appetite and weight gain. HCA also causes calories to be burned in an energy cycle similar to thermogenesis. It is exciting new technology in all-natural weight management. Sida Cordifolia Extract - Improves blood circulation. Also improves energy and stimulates BAT activity (the burning of stored body fat). Citrus Aurantium Extract - Burns fat, increases physical performance, and builds lean muscle mass. Chinese call it Zhi Shi and use it for congestion, indigestion, to stimulate gastrointestinal functions, and to improve circulation and liver function. Always consult your health professional before taking any dietary supplement. Seek advice from a health care practitioner prior to use if you are pregnant or lactating, or if you have high blood pressure, heart or thyroid disease, diabetes, prostate enlargement, or if taking a MAO inhibitor or any other prescription drug. Reduce or discontinue use if nervousness, tremor, sleeplessness, loss of appetite, or nausea occur. Not for children under 18. Not for the treatment of any illness. Always consult your health professional before taking any dietary supplement. This statement has not been evaluated by the Food and Drug Administration. This product is not intended to diagnose, treat, cure, or prevent any disease.